If you think you know how to write an article, what’s the best of the blogging platforms for you to publish it? Article writing is my thing, but it’s tough to decide where to publish your content, as there are so many blog sites today for self publishing, whether what you want to publish online is news or news articles, a how to article, or even an online journal of your personal thoughts on any and all subjects. And that’s why I want to share with you my own content strategy for where I publish the different types of content that I write (and I also use different writing styles for each platform). That means I publish some stuff on my company website (a WordPress blog), some things on Medium.com and some things as LinkedIn articles. The best case scenario is that they’ll fulfill your marketing objectives: send you a query through your site’s contact form, or they might subscribe to updates or to your newsletter.Here’s a recent Sounds Serious article about how to get followers on Twitter. 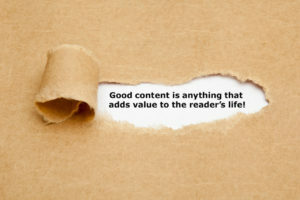 Good content is anything that adds value to the readers life, appearing behind torn brown paper. Considering how many contacts you have on LinkedIn, posting LinkedIn articles can be an awesome way to reach quickly potential target group with all kinds of material; hopefully, what you’re publishing is mostly related to work, life and the intersection of those two things (at least that’s my philosophy for publishing on this platform). I have submitted blog posts to LinkedIn about experiences in and changes to my work life, and about how adopting a dog has helped my overall outlook as a freelancer that has been working from home for a decade (and going a bit stir crazy because of that). Sharing your piece among your connections gives you a lot of bang for your buck because all of your connections are the most likely to see what you’ve written, and as they like, comment or share the piece, all of their connections will also be tapped into your stuff. This feature article of mine on an open-air market in Budapest reached over 2,000 people with very little effort on my part, basically just making the blog post live. Here’s an overview of Publishing Articles on LinkedIn. However, there are many contributors on Medium who use it for publishing a wide variety of content; some even utilize it to push out feature articles, or as a news blog. I’ve also got things that I’m planning to post there which are personal, controversial or maybe could even be construed as negative, things that I’m thinking but might not necessarily want clients to read. I have seen people and businesses publish long texts (with a picture of course) on Facebook as part of a Facebook campaign, and it really looks awful. The problem with Facebook text is that is there is no way to format the text or insert images to break up the text (or even links), so your Facebook post looks like something in a text editor – the writing could be good, but it looks like it has just been carelessly copy-pasted, like an afterthought; not like something that has been carefully crafted. It just doesn’t look enticing to read. Forget long text posts on Facebook until they realize that they should provide a real text editor so that our words can look pretty on the page there, too. When it comes to sharing, I say share your content on any and all social media platforms that you can, although, keeping in mind the distinction between personal and corporate material, it might pay to just let some of the private thoughts fly solo, not promoting them in the same places as your business-related material. But now that I’ve revealed to you why I think you should publish something personal here and something work-related there, I’m in real trouble – because I don’t know where the heck to publish this piece. Okay, bad joke. A journalist and public relations specialist, Drew Leifheit is the founder of Sounds Serious, a public relations and digital PR consultancy in Central & Eastern Europe that specializes in feature stories, executive c-level interviews, podcast production, voiceovers, and internal newsletters. Sounds Serious’ areas of expertise include the energy sector, geopolitics, climate change, international affairs, professional services, and brand management.